Acer – the Taiwanese multinational firm has just announced its newest rugged laptop, dubbed as the Acer Chromebook 11 C771. The main highlight of this laptop is that it comes with a sixth generation Intel Core and Celeron processor, which makes it much more powerful. And it provides you improved and enhanced performance as compared to other Chromebook laptops available on the market. As I mentioned above, the laptop has a rugged body with an 11-6 inches HD IPS display which carries the support for 768 x 1366 pixels resolution. The Chromebook 11 C771 rugged notebook is 21mm thick and weight at just 1.35 kg. And the notable thing is that the laptop comes in two variants: one with the support for touchscreen and other is a non-touchscreen variant. “The Chromebook is compliant with the stringent Military Standard US MIL-STD 810G that validates its ruggedness, durability and quality. In addition, the corner-shield structure and rubber bumpers surrounding the display and keyboard further protect the Chromebook, so it can tolerate drops from heights up to 48 inches (122cm),” the company said. 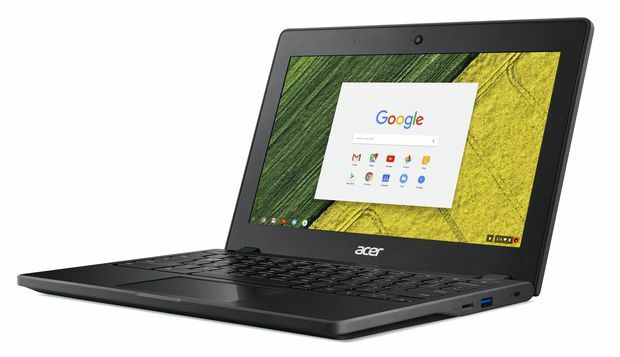 What I like most about the Acer Chromebook 11 C771 is that, the laptop comes with a massive and powerful battery which claimed to provide you an impressive 13 hours of battery life. Aside from the battery, the laptop packs 4 gigabytes of high speed RAM along with 32 gigabytes of built-in storage capacity with the option of MicroSD card slot for further storage expansion. In terms of connectivity, the laptop offers you a USB 3.1 Type C port, two USB 3.0 ports, an HDMI port, and 3.5mm headphone jack as well. The device comes with the support for fast dual-band 2×2 MIMO 802.11ac/a/b/g/n Wi-Fi. If you are interested, so you can grab it from the company’s official site or other retailers store as well. The non-touchscreen model retails for $279.99 or you have to pay slightly more for the touchscreen model, retails for $329.99, both are available in the United States.